Much of the variability in the surface ocean’s carbon cycle can be attributed to the availability of sunlight, triggering surface heat flux and photosynthesis, which in turn regulate the biogeochemical cycling of carbon over a wide range of time scales. The critical processes of this carbon cycle regulation, occurring at time scales of a day or less, however, have undergone few investigations, most of which have been limited to time spans of several days to months. Optical methods have helped to infer short-term biological variability, but complementing investigations of the oceanic CO2 system are lacking. 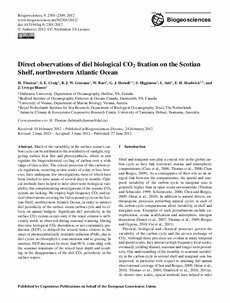 We employ high-frequency CO2 and optical observations covering the full seasonal cycle on the Scotian Shelf, northwestern Atlantic Ocean, in order to unravel diel periodicity of the surface ocean carbon cycle and its effects on annual budgets. Significant diel periodicity in the surface CO2 system occurs only if the water column is sufficiently stable as observed during seasonal warming. During that time biological CO2 drawdown, or net community production (NCP), is delayed for several hours relative to the onset of photosynthetically available radiation (PAR), due to diel cycles in chlorophyll a concentration and to grazing. In summer, NCP decreases by more than 90 %, coinciding with the seasonal minimum of the mixed layer depth and resulting in the disappearance of the diel CO2 periodicity in the surface waters.